John Flaherty was in a different spot in 1995 than he was a season earlier. In 1994, he was out to prove his old team made wrong decisions in bringing in other catchers to compete for the starting and backup jobs. "I want to show them that my hitting's come on and, hopefully, make them think twice about some things," Flaherty told The Associated Press in March 1994, two weeks before being shipped to the Tigers. But with the Tigers, he found a home. He only played 34 games for the Tigers that year. But the next, in 1995, Flaherty was in 112, hitting 11 home runs. By the end of June, his Tigers were going to Fenway. He told The Hartford Courant he felt he'd already proven the trade was a mistake for the Red Sox. It was time to move on. Flaherty went on to a career that spanned 14 major league seasons, and went through Detroit, San Diego, Tampa and the Bronx. His career is continuing today as a reporter and analyst for the YES Network. 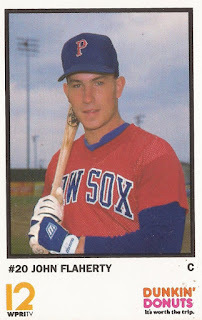 Flaherty's career began in 1988, taken by the Red Sox in the 25th round of the draft out of George Washington University. He hit AAA Pawtucket in 1990 and then debuted with Boston in April 1992. That first year with Boston resulted in only 35 appearances for Flaherty. He hit just .197. His second year was worse. He got into only 13 games and hit .120. Then came spring 1994 and the trade to the Tigers. Getting daily playing time with the Tigers in 1995, Flaherty improved his average to .243. In 1996, he hit .284 on the year in 119 games. Mid-year, Flaherty was sent to the Padres, hitting .303 in 72 games. He was also in the middle of a pennant race. "Obviously, I was excited," Flaherty told The New York Times of the trade. "I think that's an understatement. For me, it's the first time being in a pennant race. It's something every player looks forward to in his career." Flaherty hit .273 in 129 games for the Padres in 1997. After the season, the Padres sent Flaherty to the fledgling Devil Rays, where he stayed through 2002. With the Rays, Flaherty broke up a Pedro Martinez no-hit bid in late August 2000. Earlier in that month, Flaherty hit a walk-off against the White Sox. "I was probably as focused on that at-bat as I've ever been in my career," Flaherty told The AP after his walk-off. Flaherty signed with the Yankees for 2003, staying with the Bombers through 2005. According to his YES profile, he is best remembered for another walk-off, a walk-off single in 2004, beating the Red Sox. It was the same game as Derek Jeter's famous dive into the stands. "That was one of the craziest wins we've seen," Flaherty told reporters afterward.